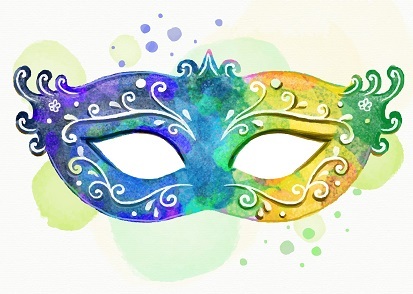 Home » Cooking » Mardi Gras: Music, Magic, and Some Amazing Meals! Mardi Gras: Music, Magic, and Some Amazing Meals! Happy Fat Tuesday everybody! In celebration of Mardi Gras this year, I decided to try my hand once again at exploring the vibrant flavors of New Orleans with a mixture of enticing cuisine, some magic themed gaming, and a few beers all set to the background notes of some Zydeco and jazz. Now all that’s missing to bring the Carnival season to my home are the masks, beads, and throws! Unlike last year, I decided to keep it simple and provide just one entree and dessert for my group as, yet again, I have to work a closing shift and I don’t want to be left with the huge amount of dishes piled up like I had last year! Season and brown the chicken in oil over medium to high heat. Add sausage to pot and saute with chicken. Remove the chicken and sausage from pot, leave the drippings in the pot. Saute onions, celery, green pepper, and garlic in the drippings until desired tenderness. Return chicken and sausage to the pot. Add liquid, bay leaves, and Joe’s Stuff and bring to a boil. Add rice, stir together and return to rapid boil. Stir again and remove the pot from the heat and cover. Let this rest for 25 minutes. Remove the cover and quickly turn rice from top to bottom completely. Add green onions and chopped tomatoes if desired. 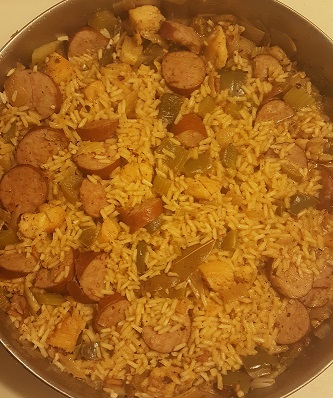 For brown Jambalaya, add 1 ½ teaspoon to 1 Tablespoon of Kitchen Bouquet (available for online purchase here, but also sold in various stores.) in between steps 2 and 3. For red Jambalaya, add ½ cup paprika and use a ½ stock ½ tomato juice or V-8 mixture for your liquid. There are numerous options for King Cake Babies! I really like the metallic ones that I found on Amazon this year!! Last year, I finished out my food experience with a combination of homemade beignets and those made from a Cafe du Monde box mix. This year, however, I thought I’d give myself a real challenge and explore the world of King Cakes! 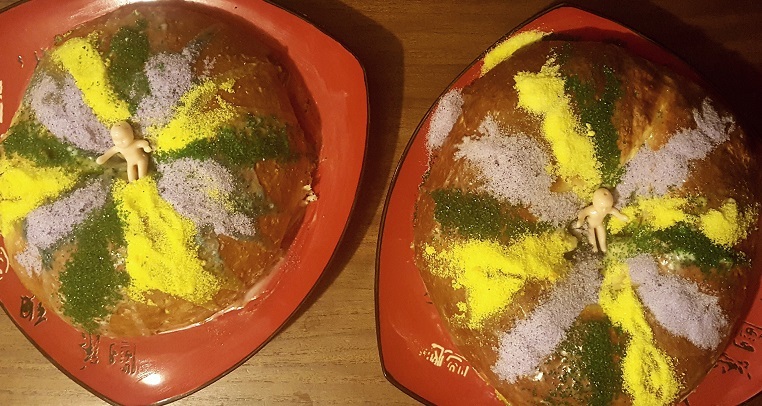 Though traditionally, a King Cake is eaten on January 6th in honor of Epiphany, or Twelfth Night, this usually sweet, ringed pastry is also eaten throughout Carnival season and is an extremely popular treat during Mardi Gras. These cakes are often coated in a glaze and then covered in Purple (representing Justice), Gold (Power) and Green (Faith) sugars. Many come in a variety of fillings, while others have no filling at all. However, they are all commonly round or oval in shape. Trinkets such as a baby, small coins, crowns, or even crosses are sometimes baked or embedded into these cakes. The modern tradition of the plastic baby, however, originated in New Orleans at McKenzie’s Bakery back in the mid-1900s, according to Donald Entringer Sr., the late owner of the chain. Finding this plastic trinket is especially important during Mardi Gras celebrations because the person who receives it in their slice is responsible for providing the King Cake at the next party! Heat milk to just before boiling. Add ¼ cup of butter to hot milk and allow mixture to cool to room temperature. In a large bowl, dissolve yeast in the warm water with 1 Tablespoon sugar. Let stand until foamy, approximately 10 minutes. When yeast is bubbling, add the cooled milk mixture. Stir in the remaining sugar, salt, and nutmeg. Add the flour one cup at a time. When the dough has pulled together, turn it out onto a lightly floured surface and knead until smooth and elastic, about 8-10 minutes. Cover with a damp cloth and let rise in a warm place until doubled in volume, about 2 hours. 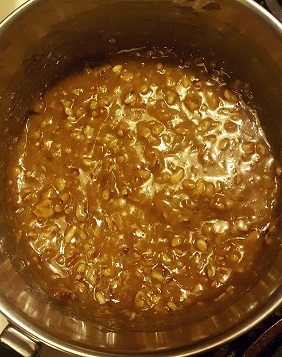 Pecan Praline Filling (this will be spooned on top of the plain cream cheese filling during the King Cake assembly). 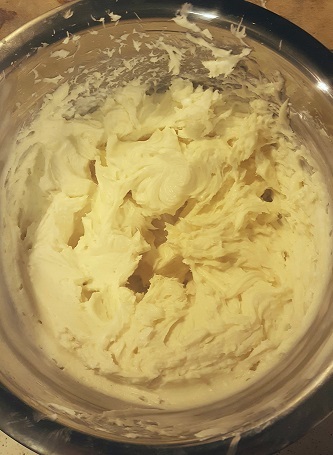 Beat cream cheese and sugar at medium speed until light and fluffy. Add vanilla and salt. Beat until combined. Place in refrigerator until ready for use. Stir the butter, egg yolks, sugar, and salt together in a medium saucepan over medium heat. Bring to a boil while stirring constantly. Continue stirring for another 3-5 minutes until thickened and begins to pull away from the sides of the pan. Remove pan from heat and stir in vanilla extract and chopped pecans. Let cool, about 20 minutes. Place in refrigerator for about an hour. Cherry Bourbon Cream Cheese Filling (I paired it with a Cherry Pie filling to give it more fruit, but the recipe is amazing as is!). Combine cream cheese and sugar in a medium bowl. Beat until smooth and creamy. Add cherry bourbon and beat to combine. Combine sugar, lemon juice, and 3 Tablespoons of water in a deep bowl, whisking until smooth. If icing is too stiff, whisk in 1 Tablespoon of water at a time until spreadable. Roll dough halves out into large rectangles (approximately 10 x 16 inches) on a flour covered surface. Spoon the cream cheese mixture along the full length of the dough, about 3 inches from the edge. For the pecan praline filled King Cake: Spoon the pecan filling over the plain cream cheese mixture. For the cherry filled King Cake: Spoon cherry pie filling over the cherry bourbon cream cheese mixture. Beginning with the long edge, roll the dough into a jellyroll or log shape, stopping with about 3-4 inches left. Coat the exposed dough with egg wash to act as a “glue” and finish rolling. Pinch closed all of the way across. Turn the dough so the seam is on the bottom. Shape dough into a ring and connect the ends. Use more egg wash to help “glue” then ends together if needed. Cover the dough with a towel and allow to rise in a warm spot until doubled; about 45-90 minutes. Bake at 375 degrees Fahrenheit for 10 minutes, then turn heat down to 350 degrees Fahrenheit and bake for an additional 20-25 minutes, or until a cake tester comes out clean. Once cool, pour icing over the cake, cover with colored sugars in individual rows about 2-3 inches wide of purple, green, and gold. Bury the baby inside or place on top. My finished King Cakes! (The plates are facing different directions so I can remember which cake has which filling). Bring on the beads and wishing everyone a happy Mardi Gras!